When Information Sifting resolves, can the Corp choose for one of the piles to contain 0 cards? The Corp cannot make a facedown pile of 0 cards. At least 1 card must be in each pile in order for it to be a pile and for it to be facedown. If HQ does not contain enough cards to make 2 piles when an Information Sifting run is successful, what happens? No cards are accessed. The access step has been mandatorily replaced by Information Sifting’s ability, and that ability cannot successfully resolve. In what order are the cards in a pile created by Information Sifting accessed? The Runner chooses the order in which the hidden cards are accessed, just like with remote servers. In practice, this means the Runner can either accept the Corp’s ordering or shuffle the chosen pile. If Leela Patel plays Information Sifting and accesses an agenda in the chosen pile, does she access the card returned to HQ? No, the Runner’s regular access step has been replaced with the ability of Information Sifting. The card added to HQ is not in the chosen pile, and as Leela must access all cards in the chosen pile, she does not have any accesses left over to access the card that was returned to HQ. If Leela Patel has an HQ Interface installed and plays Information Sifting, does she access the card returned to HQ after accessing an agenda in the chosen pile? No. When the Runner begins accessing cards from HQ or R&D, the total number of cards to be accessed is capped, regardless of modifiers or changes to the makeup of the central server. For example, if the Runner begins to access a pile of 2 cards from Information Sifting, she will only access 2 cards regardless of modifiers like HQ interface. Additionally, Information Sifting confines those 2 accesses to cards in the chosen pile. The Runner accesses Disposable HQ while accessing cards in a pile created by Information Sifting. Can the Corp put any number of cards from the piles on the bottom of R&D? Yes. The Corp can freely choose cards from either, both, or neither pile, as the cards are still in HQ. Weeeweee, what a weird card. But how does it stack up to Legwork? Well, it's 1 credit cheaper and at 1 more influence, so you should be only thinking about using Information Sifting in-faction: that one influence is better spent on other cards in other factions, and the 1-credit reduction is not a good enough reason to play this card over Legwork alone. So let's talk accesses. There will be maths, but I'll put a summary at the end for those of you who aren't playing Netrunner for the numbers. Legwork gets you three accesses at random. That means that in a 5-card hand with one agenda, you have a 3 in 5 chance of accessing that agenda, or 60%. If the corp separates their hand into a pile of 3 and a pile of 2 with Information Sifting, and you choose a pile at random, the chance of you finding the agenda is 50%. But what about multiple agendas, or high value assets and upgrades? It might be better to treat Information Sifting differently: instead, let's say that Information Sifting lets you access cards at random, up to half the number of cards the Corp has in their hand, rounded up. Side Note: Of course, this is a bit like saying that you should bet on a psi game with equal likelihood 0, 1 or 2. In a psi game, the money is spent either way, so you may want to leave enough credits to play Sure Gamble, for example, or maybe you want to force the corp to spend credits by betting 0 all the time. Likewise, the corp could divide multiple agendas between the two piles, ensuring that you find one but without risking that you find both on what could be the last turn of the game. Alternatively, if you are sitting at 6 agenda points, they have to have 4 agendas in a 5 card hand for you to have more than a 50% chance of winning when Legwork has the game in the bag. Still, it's helpful to treat Information Sifting as "access X at random, where X is half the number of cards the Corp has HQ, rounded up." In these circumstances we can say that Information Sifting accesses just as many cards as Legwork, for a 5-card hand. But Corps don't always have a full hand, and it doesn't stack up well HQ isn't at maximum capacity. Against a 4 or 3-card hand, Information Sifting accesses 2 cards, while Legwork accesses 3, and against a 2 or 1-card hand Information Sifting accesses a single card when Legwork cleans the corp out. I'm not making much of a case here for the newcomer. 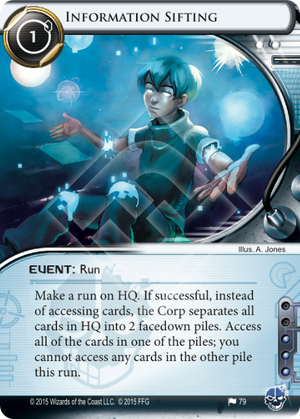 But you may spot a pattern: the more cards the corp has in HQ, the more cards Information Sifting sifts through. If the corp has 7 or 8 cards in hand, Information Sifting accesses 4 cards where Legwork accesses 3. Going back to our original scenario, but with 7 non-agendas and a single game-winning agenda, Legwork has a 3 in 8 chance of winning the game - about 37%. Information Sifting? It's still 50%. If Cerebral Imaging: Infinite Frontiers have 20 cards in hand, (and somehow only a single agenda) Legwork drops to 15%, and Information Sifting is, of course, still at 50%. Even when you consider that you aren't accessing cards at random, Information Sifting improves in value the more cards in HQ because there's more likely to be multiple agendas and other key cards. TL;DR: Information Sifting works better the more cards there are in HQ. So the boy makes a great Cerebral Imaging: Infinite Frontiers, Research Station and Cybernetics Court counter. If that's what you needed to beat your friends, then well, you have weird friends. But what else? How about Fisk Investment Seminar and Laramy Fisk: Savvy Investor? Remember, to get more value than you would from a Legwork, you need to access more than 6 cards, so I'd definitely think about playing both "Fisks" and possibly still running a combination of Legwork and Information Sifting so you can use the one you need when the time comes. But when it comes to HQ accesses, don't give up on Information Sifting just because of the confusing rules text: it might still be possible to teach an old boy new tricks.